3 Nights The River club. Return EX Livingstone airport transfers. laundry and all scheduled and non-scheduled activities (unless specified as included above). Excludes all services not mentioned in the inclusions. Airfares and Airport taxes are approximate and will be confirmed at time of booking. 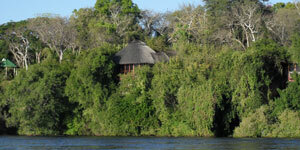 Luxury double-story thatched chalets on the Zambian side of the Zambezi River upstream from the Victoria Falls. Romance in the warm, refined decor of the public rooms, the antique furniture and the old English paintings all pay tribute to a bygone era. The River Club has a distinct Edwardian flavour, and guests here enjoy the sights and sounds of Victoria Falls and the Zambezi River in a peaceful and tranquil setting away from the crowds. The lodge overlooks the Zambezi National Park and affords excellent views of the magnificent sunsets that only the Zambezi River can offer. The River Club offers a variety of activities including a visit to the Livingstone Museum, The Railway Museum and historical Livingstone Town. A walk along the Zambian side of the Victoria Falls, a drive into Mosi-Oa-Tunya Zoological Park and a visit to a local village can also be enjoyed. Sunrise and sunset pontoon excursions, a picnic lunch on an island and fishing are all possibilities. The less energetic may opt for fly fishing from a pontoon, an afternoon of bridge or croquet on the lawn or just relaxing by the swimming pool. Boating to the Zambezi River’s islands provides relaxed afternoon activities, and fishing and sundowner trips are offered. The Zambezi National Park is located just across the river, and lion calls can often be heard at night. A rich bird life is found in the area. Hippos are regularly sighted (and heard) along the river’s edge. The River Club has 8 split-level timber and thatched chalets, 2 of which are honeymoon chalets, and overlook the Zambezi River. All the rooms have fans, and are completely open in the front, giving you the best possible views of the Zambezi. Each chalet is set on the tree-line on the edge of the steep riverbank. All the chalets have en-suite facilities with both a bath and a shower. The antique"ball and claw" baths are strategically placed for you to take in the views of the Zambezi while you indulge in a bubble bath. Dinner at The River Club can be savoured in the main dining room, on the lawn or on the veranda. With an interesting library in the main dining room, lounge and pub area, and post-dinner candle light croquet contests on the croquet lawn, you won’t be short of things to keep you entertained when dining at The River Club.